After purchasing the plugin, you’ll receive a download link via email. Click the download link to download the zip file. If you don’t get a zip file when you download, it means your browser is configured to unzip the file automatically. Change that setting in your browser so that the browser doesn’t unzip the file. Activate the plugin via the prompt, or on the Plugins Screen. 3. 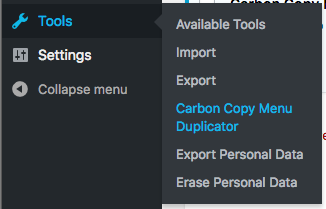 Initiate a menu copy from the Appearance > Menus screen by clicking the Copy Menu button or the Menu Duplicator tab.